o one ever tells a story about the early days in America without bringing in the name of George Washington. In fact he is called the Father of our country. But he did not get this name until he was nearly sixty years old; and all kinds of interesting things, like taming wild colts, fighting Indians, hunting game, fording rivers, and commanding an army, had happened to him before that. He really had a wonderful life. The colonists won their freedom from the English yoke, but they knew if they were to govern themselves, they needed a very wise man at their head. They made George Washington the first President of the United States of America. Of course it pleased him that such honor should be shown him, but he would have preferred to be just a Virginian farmer at Mount Vernon. However, he went to New York and took the oath of office--that is he promised, as all presidents have to, to work for the good of the United States. 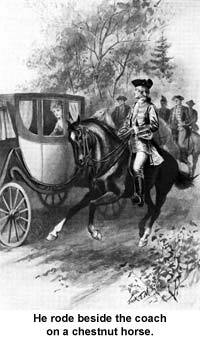 He was dressed in a suit of dark brown cloth (which was made in America) with knee-breeches and white silk stockings, and shoes with large silver buckles. He wore a sword at his side, and as the sun shone on his powdered hair, he looked very noble and handsome. He kissed the Bible as he took the oath; the chancellor lifted his hand and shouted: "Long live George Washington, President of the United States."